The first camping-place of the Israelites in the land west of the Jordan (Josh. iv. 19); the place to which they could retreat during their struggles for conquest (Josh. x. 6 et seq. ); it was also a sanctuary, the origin of which is explained in Josh. iv. 3 et seq. ; and it is mentioned as a place of sacrifice in I Sam. x. 8, xi. 15, xv. 12; comp. also II Sam. xix. 16 (A. V. 15). This Gilgal does not seem to be identical with the city visited by Samuel (I Sam. vii. 16), which should rather be identified with Jiljilya, southwest of Shiloh. Nor-even if the reading "they went down" should be accepted as uncertain—does it seem to be the Gilgal mentioned in II Kings ii. 1 et seq., from which Elijah journeyed to Beth-el and then to Jericho. 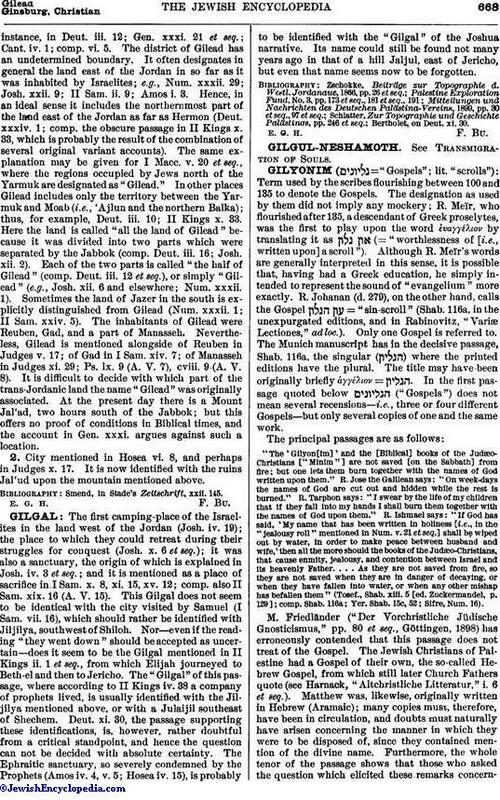 The "Gilgal" of this passage, where according to II Kings iv. 38 a company of prophets lived, is usually identified with the Jiljilya mentioned above, or with a Julaijil southeast of Shechem. Deut. xi. 30, the passage supporting these identifications, is, however, rather doubtful from a critical standpoint, and hence the question can not be decided with absolute certainty. The Ephraitic sanctuary, so severely condemned by the Prophets (Amos iv. 4, v. 5; Hosea iv. 15), is probably to be identified with the "Gilgal" of the Joshua narrative. Its name could still be found not many years ago in that of a hill Jaljul, east of Jericho, but even that name seems now to be forgotten. Bertholet, on Deut. xi. 30. E. G. H. F. Bu.